Pantile Cottage was originally two adjoining cottages with stairs in the back corners off each room found either side of the front door. From Mary Greene’s drawing you can see there were two front doors; the right one is no longer there as Bertie Cator, who lived there, made the cottages into one soon after he bought them in 1956. 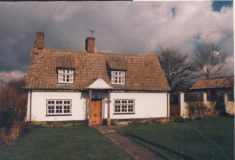 The 1893 sale document for the Long’s Harston House estate describes the cottages as stud and plaster and boarded with tiled roof. One cottage was with 3 rooms and three cottages were with 2 rooms, all rented out to labourers. 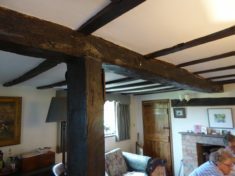 The original timber framed building was probably built around 1700 and many of the original timbers can be seen inside the old front section today in the ceiling beams and at the gable ends. Inside the gable ends can be seen slanting timbers that show the probable slope of the old sets of stairs, new stairs being added behind the old part when the back extension was added in 1984. In the two downstairs rooms in the old part the fireplace/chimney areas are very deep, going back about 3 feet so they are probably the original fireplace/range area. 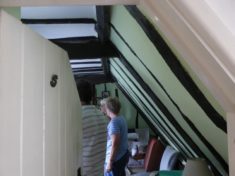 The timbers that hold up the roof can clearly be seen and when mending the roof, nails easily went through the roof layer into the bedroom below. The old bedrooms are very warm in summer. At some stage the front and back walls of the old part were bricked, with the inside plastered so they no longer show the timbers. In 1984 the house was extended with a new parallel back portion built, connected to the front by a section that included the new staircase. The new section had cavity walls, rendered outside and pantiled roof. In 1893 the Long heirs of the Harston House estate sold 4 freehold cottages on Church Street to Mr David Harper, gardener of Barrington. 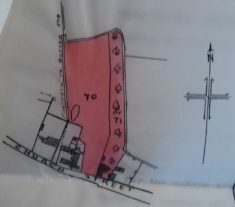 These are shown in two blocks in the square plot to right of pink plot shown on 1925 map. At that time the occupiers were Garner, Smith and Northrop, with one cottage unoccupied. Two of the cottages were in front of Pantile Cottage, right next to the Church St road. In 1928, on 10th March, Mr David Harper sold, for £80, 4 cottages & gardens then occupied by Cornell, Smith, Lary and Northrop, to Helen Catherine Greene of Harston House. 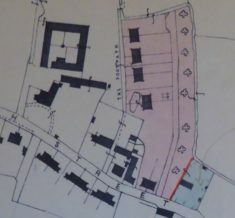 By the time of the 1949 landuse map there were only two cottages on the plot so the front two must have been knocked down. 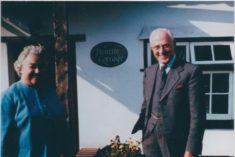 In 1956 Bertie Cator bought 2 cottages (occupied by Lowery & Cornell) from Helen Catherine Greene of Orchard Cottage for £440. 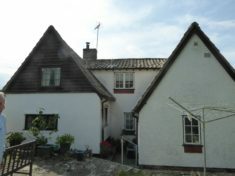 The cottages had a land frontage of 75ft 6” on the south side, with rear width of 69ft. 120 ft along west boundary, 106ft 6” along east boundary. See 1956 map. 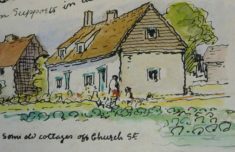 In 1958 Chesterton Rural district Council (who had bought the adjoining land from Jesus College in 1925) sold a strip of land with 4ft frontage onto Church St to Bert Cator of Pantile Cottage, 12 Church St, for £25. The land was along the western boundary of Pantile Cottage with depth of c 130ft (subject to payment of £9 2s 6p yearly to Vicar of Harston & £25 yearly to Bursar for time being to Hertford College, linked to Oxford & Jesus College). The strip of land is shown by the red line on 1958 map. Bertie Cator was to maintain the boundary stock fence. As the transactions refer to Bertie Cator of Pantile Cottage he must have made the two cottages into one by this date. After Bertie Cator died in 1976 Millie Cator remained until 1983 when the property was sold to Keith & Elsie Evans. In 1984 a back extension was added parallel to the front by the Evans. In 2005 they sold to the present occupants. This page was added on 09/07/2017.